Find hotel near Gurudwara Bir Baba Budha ..
Gurudwara Bir Baba Budha Sahib is located about 20 kilometers south from the city of Amritsar in the village of Thatta. 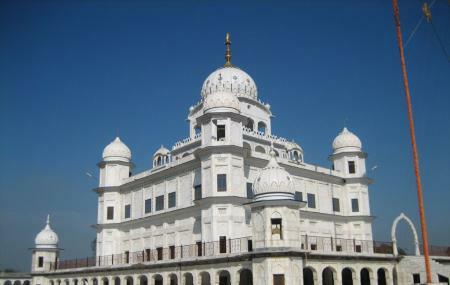 The Gurudwara is dedicated to Baba Budha ji, a respected personality born in 1506. The Gurudwara is an ideal place to introduce yourself to Sikhism and experience peace in its serene atmosphere. Pets are not allowed in the Gurudwara. How popular is Gurudwara Bir Baba Budha Sahib? People normally club together Jallianwala Bagh and Sri Harmandir Sahib Amritsar while planning their visit to Gurudwara Bir Baba Budha Sahib. People also prefer to start their day with Gurudwara Bir Baba Budha Sahib. We have started from Lithuania to Amritsar to visit this holly place. It is well maintained and I felt very peaceful when enter inside. Pond is filled with crystal clear water. I was lucky to see a beautiful fish swimming in the pond. I have waited in the queue for one hour to enter the shrine. I had a very peaceful mind there. When came outside we were offered prashadham. I will visit again if i come to Amritsar. Religious importance of this place is very special. One can feel and find that inner peace of mind here. Baba Budha ji was the first "priest" (or Giani) of Harimandir Sahib, and laid the foundations of Dera Baba Nanak and most of the holy buildings at Amritsar. GURUDWARA BEED BABA BHUDA JI is situated in Village Chabaal Distt Amritsar. BABA BHUDA JI spend much part of his life here. GURU ARJAN DEV JI also visited this place. Mata Ganga ji desired her wish for son which SHRI GURU ARJAN DEV JI suggested her to pay homage to BABA BHUDA JI and ask for putar di daat, Mata ji got delicious food prepared and visited Baba Ji here in rath. But Baba ji refused to accept the food. Later Mata ji herself prepared missi roti and a onion (pyaag) and visited Baba ji. BABA BHUDA JI blessed Mata ji with son and told her that her son would be great warrior and he will crush muslims head as he crushed the onion. And Later Mata ji and SHRI GURU ARJAN DEV JI was blessed with putar SHRI GURU HARGOBIND SAHIB JI. The more you believe the better you feel after visiting the place.